As I’ve got older I’ve somehow become more scared of heights. When I was younger I seemed to be fearless – bombing down zip lines, jumping out of planes and going on the scariest of rides. Now I can barely look out of a tall building without having to steady myself. So last week when I was invited to do yoga on the new glass floor at Tower Bridge you can be assured that I was a little bit scared. I’ve really got back into my yoga recently, but doing a downward dog when you can see the Thames – now that’s a new experience! As we arrived we were shown to the glass floor and if I’m honest I was scared just looking through it. Rolling my yoga mat out on it it didn’t quite lie flat but instead of walking over to correct it I tip toed my way over the glass floor, just in case I fell through it! Of course I knew I wouldn’t – apparently something like one elephant can stand on the glass floor without it breaking, but my ‘new-found scaredey cat mind frame didn’t seemed to understand that as nerves got the better of me and my hands went slightly clammy. 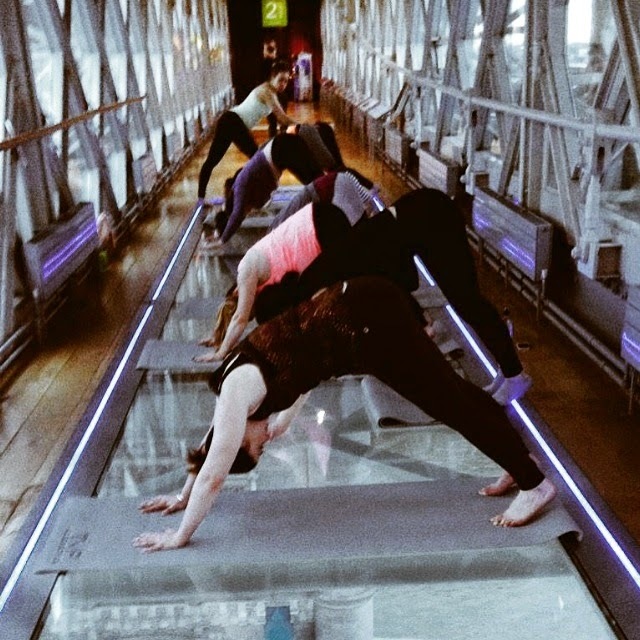 As the class started, with some cat stretches, I felt like I was doing yoga in mid air – suspended above the Thames – they say do one thing that scares you every day, I think this was my quota for at least a month. The 45 minute class covered everything you’d expect from a normal yoga class, quite a lot of downward dogs, even more planking, various sun salutations, and I really enjoyed it, sometimes even forgetting that I felt like I was suspended over the Thames, and at any moment going to plummet on to the unexpected people below me making their daily commute to work. Ha, it wasn’t really that bad, but it was definitely an eye opener and one for all those who are looking for a new experience in London.